Get black hearts on kindle now! Fighting a psychic wasn’t enough to test his luck, so Jax Jensen has decided to pursue leads regarding the Black Hearts associates operating down on Kayama. A lush green world full of beasts and beauty, Kayama is home to a populace full of strange customs and jungles filled with exotic plants and deadly wildlife. His journey takes him into perilous canyons and strange villages. Jensen can only hope he’ll make it through the bloodbath to come. Beastly threats aside, another agent has arrived on the planet to apprehend the same target, the slaughter he leaves in his wake will prove a traumatic experience for all involved underscored by ominous threats of destruction to come. 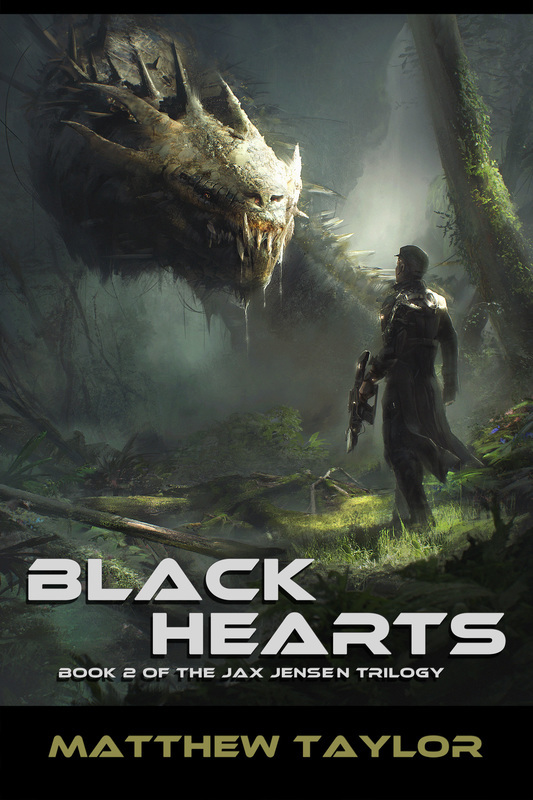 "Black Hearts", book two of The Jax Jensen Trilogy, following the well-received “Heedless”. Great story and great entertainment value! If Starship Troopers and Star Wars had a baby and that baby hooked up with Firefly and had a baby.